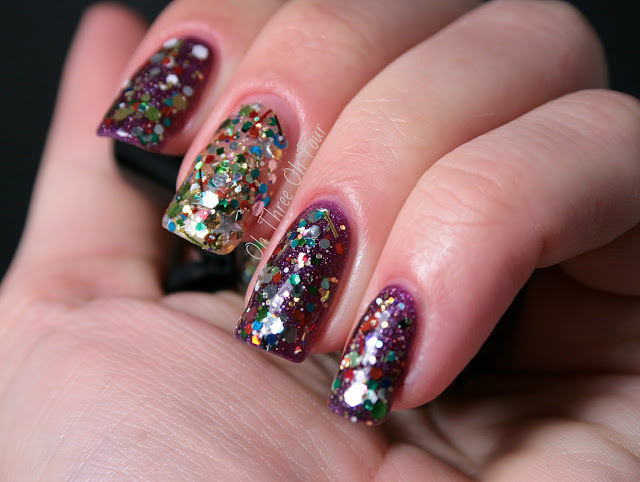 Lacquerhead Polish Just Be Claus is a white based polish with green and red glitters of different sizes and red stars. All nails are 3 coats with a top coat of Seche Vite. Naughty Or Nice Naughty or Nice has a red creme/jelly base with different sizes of red glitters and ultra fine green glitters. I used 2 coats of Naughty or Nice with a top coat of Seche Vite. Save The Bows has got a little bit of everything! A variety of glitters in an assortment of colors, shapes and sizes and fine holographic glitter and silver stars scattered throughout, like I said a little of everything! ;) With the exception of my middle nail, I started with 4 coats of Lacquerhead Polish Plum Crazy (will post this one soon!) and added 1 coat of Save The Bows. My middle nail is 3 coats of Save The Bows over bare nail. All nails have a top coat of Seche Vite. The name of the polish is hilarious! Everyone has to have someone in their family that asks you to save the bows, boxes, bags, ect. during the holidays, I know a few. ;) If every bow were as sparkly and pretty as this polish, I would save them all too! 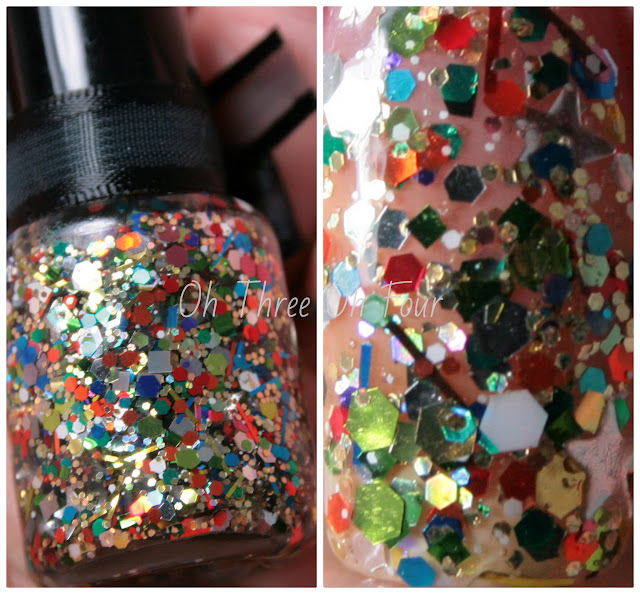 Absolutely no "fishing" for glitter in this polish; I got a ton of glitter with just 1 coat! Dry time was average and it was a little "bumpy" feeling with no top coat, so I used to Seche Vite to help with both of those aspects. Save The Bows is unique from other glitter polishes I own like it, it has more of a gold/yellow tone about it. Find Lacquerhead Polish on etsy here. Currently, she is out of stock of Just Be Claus but will be restocking on Sunday. 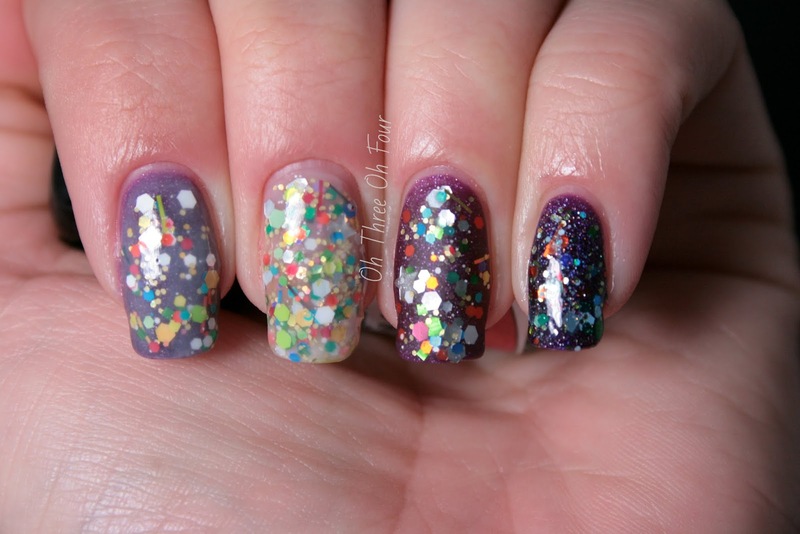 She has a ton of amazing new jelly polishes in stock that I can't wait to show everyone! Also, make sure to like Lacquerhead Polish on Facebook here to keep updated on new polishes she has coming up, I'm loving the look of You're The Fruit In My Nutcake she posted a photo of yesterday! The Lacquerhead Polish polishes in this post were sent for review, all opinions are my own.